Gums can recede, or pull away from your teeth, for various reasons. Some people naturally have thin gum tissue. Others brush their teeth too aggressively with a hard-bristle toothbrush, which causes their gums to recede. Periodontal disease—gum disease—can cause receding. 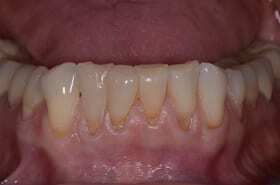 Or, the position of the tooth can cause receding of the gums. Gums that pull away from your teeth not only detract from the appearance of your teeth and smile, but they also can cause sensitivity in your teeth and make them more prone to decay. 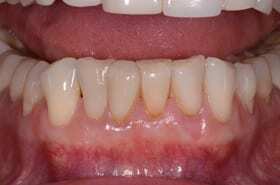 Receding gums can also contribute to bone and tooth loss. There is another reason that you may need more gum tissue. Insufficient healthy gum tissue makes it difficult, if not impossible, to support dental implants. Gum grafting, as this treament is often called, stops gum recession and restores gum tissue, contributing to a healthier and more attractive smile. Dr. Duane Delaune grafts soft tissue to restore receding or inadequate gum tissue and give you a natural-looking gumline. It is common to autograft tissue from your palate for use in your gums. But many dental professionals, including Dr. Delaune, use AlloDerm® Regenerative Tissue Matrix to help your body regenerate healthy gum tissue. AlloDerm uses carefully screened, extensively tested, and thoroughly sterilized donor tissue, which ensures that pathogens aren’t transmitted to you from the graft. Your gums will adopt the grafted tissue and remodel it into your own gum tissue for a seamless match. The pictures below show how Dr. Delaune used soft-tissue grafting to restore receding gum tissue for a patient. The procedure is minimally invasive. It usually lasts forty-five minutes to an hour. Dr. Delaune will give you instructions on making sure your mouth is kept clean in order to promote the healing process. You will have a few follow-up appointments for Dr. Delaune to check the healing process. After your gums heal, your gumline will look natural and healthy.